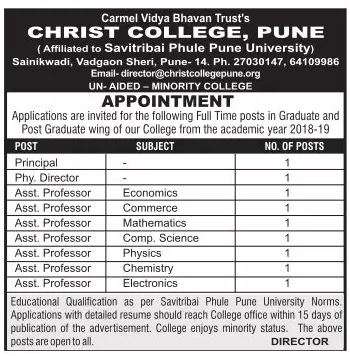 Christ College, Pune has advertised in LOKSATTA newspaper for the recruitment of Assistant Professor vacancies. Interested and eligible job aspirants are requested to apply with in 15 days. Check out further more details below. About College: Christ College, Pune is a Christian minority institution affiliated to the Savitribai Phule Pune University. The College is recognized by Government of Maharashtra and managed by Carmel Vidya Bhavan Trust of the CMI (Carmelites of Mary Immaculate) congregation.